Boboli is an obvious choice for the best Florentine garden, and yet there is nothing obvious about it. Hidden behind the forbidding bulk of Palazzo Pitti, the garden itself is a surprise—unless you know it, you wouldn’t guess it is there. And, once inside, vistas change suddenly at every corner. The soaring Egyptian obelisk in the amphitheatre just outside the palace. The grandiose avenue that leads from there to the Renaissance glory of a muscular Neptune pointing his trident at a gigantic shell and the pond below. 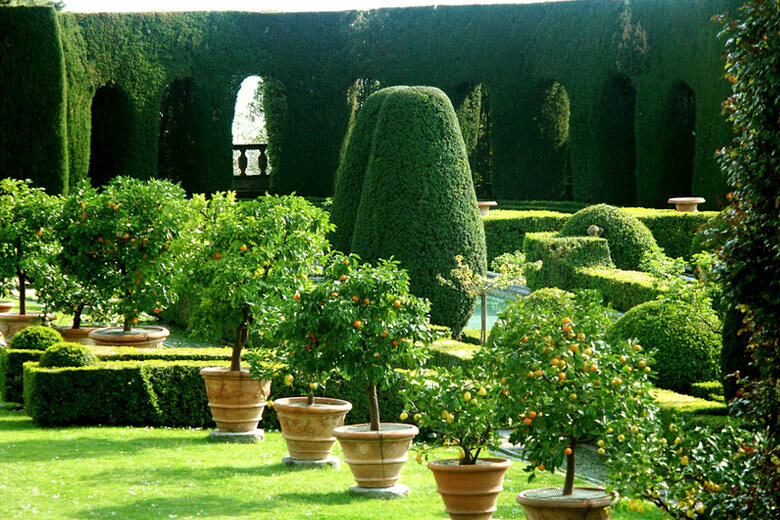 The box hedges around the Casina del Cavaliere, neat and elegant above the jumbled olive groves of the Florentine hills. The huge red dome of Santa Maria Novella, shining in the distance from the vantage point of the graceful Rococo Kaffeehaus. The artistic madness of the Grotta Grande, a whimsical frenzy of mosaic, statues and stalactites created by Buontalenti at the foot of the Corridoio Vasariano. The infinite, cypress lined Viottolone, opening up into the Vasca dell’Isola, a statue-strewn basin surrounding a rose and citrus-planted islet that is home to a sculpture by Giambologna. Nearly every Florentine ruler left his mark on the garden, commissioning statues, opening paths and adding buildings to suit their taste. And yet Boboli has an austere, formal elegance that gives a sense of unity to this organic growth. But it is sheer luck it is still there—in the 19th century, Boboli narrowly escaped Grand Duchess Elisa Baciocchi’s whim to turn it into an English garden. For an even more secretive dream, head to the nearby Bardini gardens on Costa S. Giorgio, 2. Also recommended is the 'rose garden' below located between Viale Poggi, Via di San Salvatore and Via dei Bastioni under piazzale michelangelo. Best to go between mid-April - June to see the full bloom. The Giardini di Boboli, in Piazza Pitti 1, Florence, is open from 8.15am to 7.30pm in June, July and August, from 8.15am to 6.30pm in April, May, September and October, from 8.15am to 5.30pm in March and from 8.15am to 4.30pm in November, December, January and February. Tickets are €7 (concessions €3.50). For more information, call +39 055 294883. A cream Florentine villa, serenely elegant under a red roof, surveys the cypress-encrusted hills around Florence and the aqua expanse of the Arno that skirts them. It is supremely beautiful—but the gardens around it (almost) steal the show. Set against the pure geometry of sculpted trees and shrubbery, fierce lions stand sentinel over delicate roses, fat lemons and juicy oranges peek among waxy green leaves, and graceful statues pepper a lawn that is really a bowling green. The Gamberaia design is quintessentially Italian—a good portion of it was already established by the 18th century, when the Marchesi Capponi lived at the villa—and yet it is partly the result of foreign hands. The glimmering parterre d’eau sprinkled with putti, which ends in a verdant arcade and a balcony overlooking the thousand greens of the Florentine countryside, was the brainchild of an Eastern European princess, Giovanna Ghika, who owned La Gamberaia for a time. 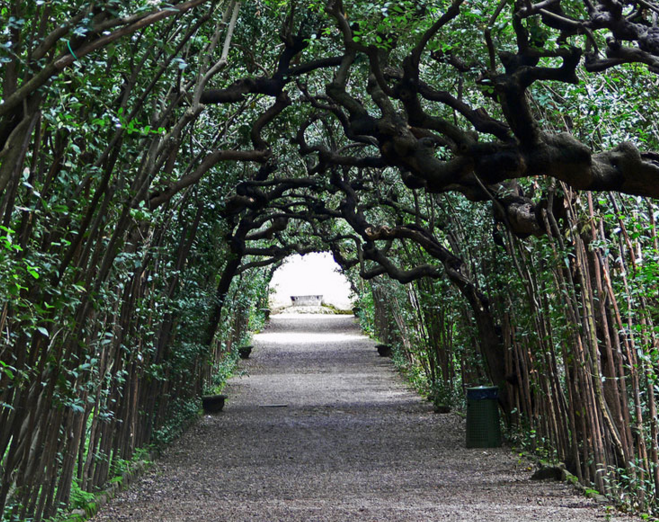 La Gamberaia’s gardens, in Via del Rossellino 72, Settignano, are open to the public daily from 9am to 7pm (but the ticket office closes at 6pm) €15 per person, while the villa can be visited are by appointment only. It is also possible to stay at one of La Gamberaia’s own guest houses. For more information, see http://www.villagamberaia.com or call +39 055697205. 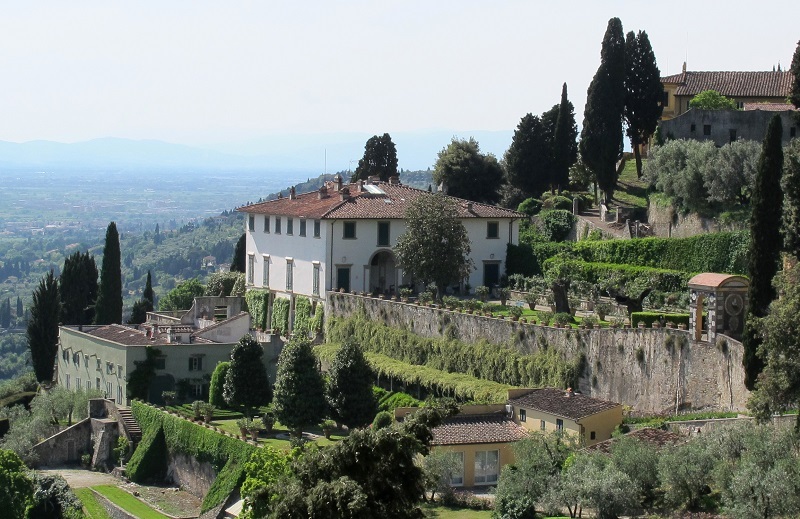 Perfectly trimmed box, jaw-dropping views over Florence’s roofs and echoes of Renaissance history fill the elegant Italian gardens at Villa Medici, in Fiesole. This was once the heart of Florence’s cultural life, the place where Lorenzo Il Magnifico—who inherited the villa from his brother Giuliano, who in turn had had it from their uncle Giovanni—gathered the coterie of artists, philosophers and intellectuals that made the city great. I picture them walking along the terraces talking of gardens and art. After all, a country villa with a garden was still something of a novelty those days. In a departure from tradition, Giovanni de’ Medici, who wanted to create a haven for relaxation, entertainment and intellectual life, had chosen to surround his newly-built house with gardens rather than the customary orchards and farmland. Over the centuries, Giovanni’s garden grew and changed, thanks to the many owners who added and renovated the villa, to become what is today—three terraces carved on a hillside overlooking Florence. A cypress-lined avenue leads to the first terrace, an emerald sea of lawns dotted with potted lemon trees in late spring and summer. Huge magnolia trees guard box-encased flowerbeds in the second terrace. But it is the third which feels the most Italian—bizarrely so, because it was created in Renaissance style at the beginning of the 20th century by an English landscape designer, Cecil Pinsent, in the place where the original Medici vegetable garden might have been. I like to think Giovanni would have approved. Villa Medici, in Via Beato Angelico 2, Fiesole, is still a private home. The gardens can be visited by appointment only. This is easiest to do this is to join a pre-organised garden tour (offered by many companies). Otherwise, call +39 055 59164/59417 or fax +39 055 2398994 to ask for an appointment.